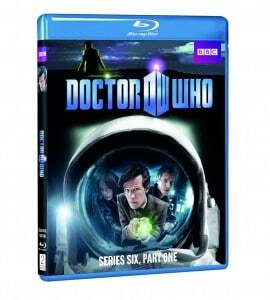 Doctor Who: Series 6, Part 1, a two-disc DVD and Blu-ray set, contains the first seven episodes along with two Monster files, “The Gangers” and “The Silence,” two of the Doctor’s most challenging opponents. In the season opener, “The Impossible Astronaut,” four envelopes are received, numbered 2, 3 and 4, each containing a date, time and map reference, unsigned, but in TARDIS blue. Who sent them? And who received the missing number one? This strange summons reunites the Doctor (Smith), Amy (Gillan), Rory (Darvill) and River Song (Kingston) in the middle of the Utah desert and unveils a terrible secret the Doctor’s friends must never reveal to him. ‘Space 1969’ is their only clue, as their quest lands them – quite literally – in the Oval Office, where they are enlisted by President Nixon himself to assist enigmatic former-FBI agent Canton (Mark Sheppard) in saving a terrified little girl from a mysterious spaceman. I remember the show Doctor Who being on TV when I was a kid although I never really watched it. This was actually my first time to see the series, but John is a fan. I would have to say this is more his style of show than mine. He loves anything to do with outerspace and the more science fiction the better! John really enjoyed the DVD and sat down to watch the seven episodes in a matter of two days. I had a hard time keeping up only because I’m not really familiar with the show, but he did his best to explain the background of the characters and the show. I think we will be seeing more of Doctor Who in our household if John has his way. It’s definitely a keeper! I LOVE Dr Who! I had never even heard of it until this year, a friend introduced me. Hubby won’t watch it with me though, lol. A little too odd for him. Brightest spot in television land. It is the only television we watch in our house. I didn’t really like the old Doctor Who shows (don’t tell your husband), but the new shows, with the last two Doctors are amazing!